Amplifying practical solutions, the Less = More Green Map of NYC highlights local waste reduction sites and strategies with handy neighborhood and citywide interactive maps. Green Map System supports inclusive participation in sustainable community development using mapmaking as our medium. Our dozen editions of NYC Green Maps benefit our home community and act as models for other cities, as seen at Green Map System engages community participation using maps that connect people to local green living resources, natural, cultural and activism sites. Our dozen editions of NYC Green Maps benefit our home community and act as models for other cities in the global Green Map movement, as seen at GreenMapNYC.org. Waste ventures, websites and social innovations, and more! Along with new research conducted by volunteers and interns, we’ll include key waste prevention sites from our published maps, including the interactive Compost Green Map. We encourage everyone to add to the map and contribute their own practical tips, photos and videos to enhance the sites. With your support, we can inspire meaningful personal change and improve the quality of life for all New Yorkers. Use your mobile smartphone to suggest new sites as you visit them at GreenMap.org. We’ll check your suggestions and publish them directly. Check online often and watch the map grow! Click Updates above to find out about our next Waste Reduction Salon where you can join a group discussion that will spark new ways people can waste less every day. We’ll also be surveying neighborhood resources, agencies and organizations to make sure that Less = More becomes a comprehensive resource. Later this fall, watch for the ‘close up maps’ start to appear around town! In addition to these map stations and take-away cards, Less = More will be promoted with a launch party, press outreach, social media and online. We’ll invite everyone to embed Less = More in their own website or blog, too! The Less = More project will continue to grow in 2013 – contact us if you would like to support further phases, including a rollout of close up maps to more neighborhoods, print maps that can be inserted in community guides, local newspapers or school newsletters. We expect to create a variety of poster, printed and interactive map resources in order to reach and activate more New Yorkers, including a citywide highlights print map, funded by Con Edison. Contact us with your partnership ideas, too, and let’s make waste a thing of the past in NYC! Few people realize how waste impacts our environment, climate and quality of life. This is not because they do not care, but often, they are simply unaware of the nearby reduction resources available to them. Currently, NYC exports 3.2 million tons of waste each year. Increasing recycling from today’s 15% to 30% will reduce CO2 emissions by 7% (and save $186 million!). Waste prevention, reuse and composting will reduce impacts even more! We’re asking ioby donors to support the ‘close up’ editions of the map, to be placed at 20 locations citywide. At $75 per placement, this includes map ‘localization’, design, printing, lamination, takeaway cards and interaction with the place. All money raised on ioby went toward the cost ($1,500) of printing the maps. Good News! 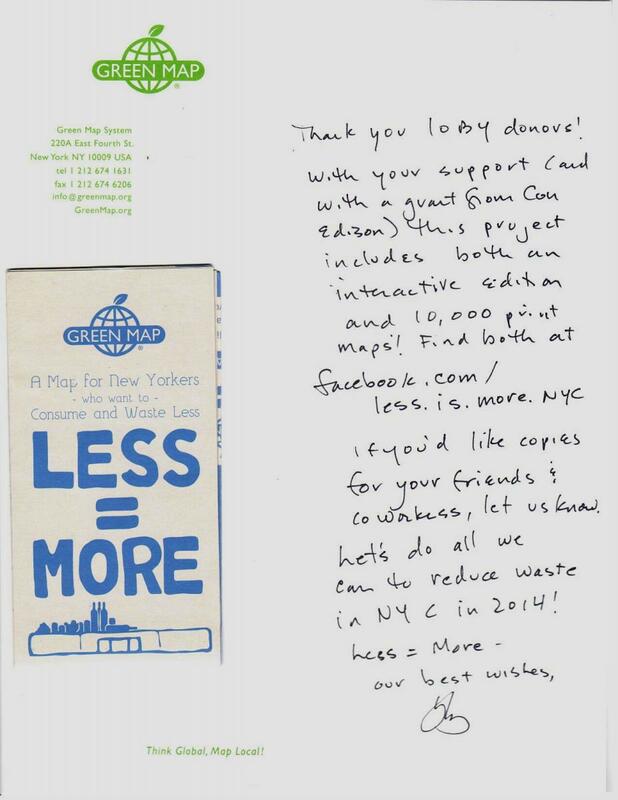 Con Edison is supporting the printed edition of the Less = More NYC Green Map! This means we will be able to provide thousands of free maps featuring highlighted sites and tips for reducing waste and consumption. People who visit the 20 sites with neighborhood close up maps that we will create with your IOBY contributions will be able to take these folding maps home, to work, school, etc. And yes! we will print on recycled paper and minimize waste with an awesome yet compact design that people will want to post on the wall, keep and refer to often. We'd love to hear from more partners about creative ways the Less = More map can inspire and catalyze much needed wastelessness throughout the 5 boroughs. Green Map System would to invite volunteers to pitch in on the Less = More Green Map of NYC on Monday, August 13 from 6:30 - 8:30 pm at our office, 220A East 4th Street (between Aves. A and B in the East Village). We'll be brainstorming a marketing campaign as well as prioritizing the content of this much-needed map which is described here - https://ioby.org/project/less-more-green-map-nyc. Less = More will include compost, innovative second-hand and iconic waste-reducers, and much more, citywide. If you can help with the surveying this summer, and later, with distribution, we'd like to hear from you.